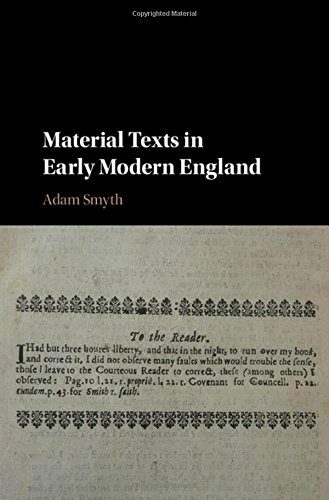 Exonian Adam Smyth (1990, Modern History), Fellow in English Literature 1350–1660 at Balliol College, has published Material Texts in Early Modern England with Cambridge University Press. By combining book history, bibliography and literary criticism, Material Texts in Early Modern England explores how 16th- and 17th-century books were stranger, richer things than scholars have imagined. Professor Smyth examines important aspects of bibliographical culture which have been under-examined by critics: the cutting up of books as a form of careful reading; book destruction and its relation to canon formation; the prevalence of printed errors and the literary richness of mistakes; and the recycling of older texts in the bodies of new books, as printed waste. How did authors, including Herbert, Jonson, Milton, Nashe and Cavendish, respond to this sense of the book as patched, transient, flawed, and palimpsestic? Material Texts in Early Modern England recovers these traits and practices, and so revises our sense of what a book was, and what a book might be. To find out more about Material Texts in Early Modern England and to purchase a copy click here.